The NHL announced that the regular season salary cap rise after the initial season. The 2006–07 salary cap was increased by $5,000,000 (US) per team to bring the salary cap up to $44,000,000 (US). While the 2006–07 salary floor was increased by $8,000,000 (US) per team to $28,000,000 (US). This is the only year where the NHL salary floor raised faster than the NHL salary cap. The Mighty Ducks of Anaheim officially shortened their name to the Anaheim Ducks prior to the season, introducing a new logo, uniforms and color scheme. This reflected a clean break from their original owners, The Walt Disney Company, who originally named the team after the movie, The Mighty Ducks upon their formation in 1993. No NHL player had worn the jersey number 84 until Guillaume Latendresse of the Montreal Canadiens began doing so at the start of this season. The NHL All-Star Game returned after a two-year absence when the Dallas Stars hosted the 55th National Hockey League All-Star Game at the American Airlines Center on January 24, 2007. Dallas hosted the All-Star Game for the first time, and it was the first time the Stars franchise had hosted the game since 1972, when it was hosted by the-then Minnesota North Stars. The West defeated the East by a score of 12–9, with Danny Briere of the Buffalo Sabres being named MVP of the game. Fewer penalties were called than in 2005–06 (an average of 398 per team). This led to fewer goals scored overall (7,082) and more shutouts (150). However, more even-strength goals were scored (4,715) than in 2005–06 (4,579). This season would have an intense battle between Martin Brodeur and Roberto Luongo for the Vezina Trophy and a piece of NHL history. Both goaltenders were vying to break Bernie Parent's NHL record 47 wins in a single season. On April 3, 2007, Brodeur tied the NHL record for most wins in a single season with 47, set by Parent in 1973–74, in a 2–1 shootout victory against the Ottawa Senators. Two days later, he broke the thirty-three-year-old record with his 48th win in a 3–2 victory over the Philadelphia Flyers, which helped the Devils clinch their seventh Atlantic Division title and the second seed in the Eastern Conference. Luongo finished with a career-high 47 wins, one shy of Brodeur, and consequently finished runner-up in a close race for the Vezina. Luongo and Brodeur are considered, however, to have been given an advantage to Parent with the inauguration of the shootout that season by the NHL, allowing more games to be decided with wins, as opposed to ties. The Carolina Hurricanes became the first team since the 1995–96 New Jersey Devils to miss the playoffs after being the defending Stanley Cup Champions. The inter-conference division play had the Northeast visit the Central, the Central visit the Atlantic, the Atlantic visit the Pacific, the Pacific visit the Southeast, the Southeast visit the Northwest, and the Northwest visits the Northeast. Buffalo Sabres won the Presidents' Trophy and home-ice advantage throughout the playoffs. For the purpose of conference rankings, division leaders are automatically ranked 1–3. These three, plus the next five teams in the conference standings, earn playoff berths at the end of the season. In each round, the highest remaining seed in each conference is matched against the lowest remaining seed. The higher-seeded team is awarded home ice advantage, which gives them a maximum possible four games on their home ice, with the other team getting a maximum possible three. In the Stanley Cup Final, home ice is determined based on regular season points, giving the Anaheim Ducks home ice for this year's series. Each best-of-seven series follows a 2–2–1–1–1 format. This means that the higher-seeded team will have Games 1 and 2, plus 5 and 7 if necessary, played on their home ice, while the lower-seeded team will be at home for the other games. The format ensures that the team with home ice advantage will always have home ice for the "extra" game if there are an odd number of games in a series. Pittsburgh Penguins retired Mario Lemieux's No. 66 for the second time on October 5. St. Louis Blues retired Brett Hull's No. 16 on December 5. Detroit Red Wings retired Steve Yzerman's No. 19 on January 2. Los Angeles Kings retired Luc Robitaille's No. 20 on January 20. Montreal Canadiens retired Serge Savard's No. 18 on November 18 and Ken Dryden's No. 29 on January 29. Calgary Flames retired Mike Vernon's No. 30 on February 6. Edmonton Oilers retired Mark Messier's No. 11 on February 27. Brendan Shanahan became the 15th player with 600 regular season NHL goals when he scored twice in his debut with the New York Rangers on October 5. Jaromir Jagr joined Shanahan in the 600 goal club on November 19, making Jagr and Shanahan the first teammates to reach 600 goals in the same season. Jagr also passed Jari Kurri's record for points by a European-born player and later became the 12th player to score 1,500 career points. Jagr scored his 30th goal of the season against the Montreal Canadiens on April 5, tying Mike Gartner's record for most consecutive 30-goal seasons at 15. Teppo Numminen played in his 1,252nd regular season game on November 13, passing Jari Kurri's record for most games played by a European-trained player. Teemu Selänne scored his 500th goal on November 23, becoming only the second Finnish player to reach the mark. Peter Bondra became the 37th player to achieve 500 goals on December 22, followed shortly thereafter by Mark Recchi as number 38 on January 26. On March 13, Mike Modano became the 39th player to score 500 goals. Four nights later, he passed Joe Mullen for most goals by an American-born player by scoring his 503rd goal. Pittsburgh Penguins forward Jordan Staal became the youngest player (18 years, 153 days) in NHL history to record a hat trick on February 10. Colorado Avalanche forward Paul Stastny set an NHL rookie record by scoring at least one point in 20 consecutive games, breaking Teemu Selänne's record of 17. Nineteen-year-old phenom Sidney Crosby claimed the scoring title with 120 points, becoming the youngest player in NHL history to achieve the feat. Crosby scored a goal against the Carolina Hurricanes to pass Wayne Gretzky as the youngest player (19 years, 207 days) in NHL history to reach 200 career points. The New York Rangers and Florida Panthers played a historic preseason game on September 23, 2006, when the Rangers defeated the Panthers 3–2 in the NHL's first game in Puerto Rico. On November 9, 2006, the Anaheim Ducks set an NHL open era record by remaining undefeated in regulation for the first 16 games of the season, with 12 wins and four overtime losses. The previous mark was set by the 1984–85 Edmonton Oilers, who had 12 wins and three ties. On January 2, 2007, the Edmonton Oilers recorded their 1,000th regular season win in franchise history by defeating the Florida Panthers 4–1 at Rexall Place in Edmonton, Alberta. On February 22, 2007, eight games went to overtime, setting a record for most on one day. Four of these games went to a shootout. One of the shootouts, between the Ottawa Senators and Buffalo Sabres, was the culmination of a game that saw a huge fight, the result of a late hit on Sabres co-captain Chris Drury, that resulted in 100 penalty minutes and three game misconduct ejections. On March 11, 2007, Chris Simon of the New York Islanders was suspended an NHL-record 25 games (minimum) for striking New York Rangers center Ryan Hollweg in the face with his stick during a March 8 game between the two teams. Simon missed the Islanders' final 15 regular-season contests, their five post-season games, and the first five games of the 2007–08 season. On March 31, 2007, Vincent Lecavalier of the Tampa Bay Lightning scored his 51st goal of the season against the Washington Capitals, which would be enough to ensure that he became the first Lightning player to win the Maurice "Rocket" Richard Trophy (most goals scored). Lecavalier finished the season with 52 goals. On the same night, Martin St. Louis crossed the 100-point mark for the season, making him and Lecavalier the only teammates in the 2006–07 season to reach 100 points. On April 3, 2007, Dominik Hasek of the Detroit Red Wings made 35 saves and moved into a tie for eighth place with Ed Belfour and Tony Esposito on the career shutouts list with 76, in a 3–0 win over the Columbus Blue Jackets. The shutout was Columbus' 16th of the season, setting a modern-day NHL record for shutouts against. On April 5, 2007, goalie Martin Brodeur of the New Jersey Devils recorded his 48th win of the season, setting a new record for most wins in a single season by a goaltender. The previous record of 47 wins was set during the 1973–74 NHL season by Bernie Parent of the Philadelphia Flyers. For the first time in NHL history, neither of the previous season's Stanley Cup finalists qualified for the playoffs, as both the Edmonton Oilers and defending champion Carolina Hurricanes failed to qualify. The Hurricanes are also the first Stanley Cup Champion since the 1995–96 New Jersey Devils to miss the playoffs the season after their victory. The Colorado Avalanche, with 95 points, broke the record set by the Montreal Canadiens in the 1969–70 season who had 92 points, for having the most points of any team missing the playoffs. The Vancouver Canucks broke their franchise record of the longest playoff game on April 11, 2007, winning near the end of the fourth overtime, against the Dallas Stars and marking the sixth-longest game in NHL history. On June 2, 2007, the Stanley Cup Finals returned to Ottawa for the first time in over 80 years, since the final match between the original Ottawa Senators and the Boston Bruins on April 13, 1927, was played. As reported by The Canadian Press, 99-year-old Russell Williams is in attendance, who attended the previous Finals game. The Senators won the game, 5–3. Tony Amonte Calgary Flames Olympic silver medalist, 5-time NHL All-Star, over 1100 games played. Ed Belfour Florida Panthers 1-time Stanley Cup champion with the Dallas Stars, 5-time NHL All-Star, 4-time William M. Jennings Trophy winner, Calder Memorial Trophy winner, Vezina Trophy winner, over 900 games played. Peter Bondra Chicago Blackhawks 5-time NHL All-Star, over 1000 games played. Sean Burke Los Angeles Kings Olympic silver medalist, 3-time NHL All-Star. Goaltender in last game in Hartford Whalers history, 2-1 win over Tampa Bay Lightning. Over 800 games played. Whalers all-time goaltender leader with 256 games played. Ben Clymer Washington Capitals 1-time Stanley Cup champion with the Tampa Bay Lightning. Mike Dunham New York Islanders Olympic silver medalist, William M. Jennings Trophy winner. Robert Esche Philadelphia Flyers William M. Jennings Trophy winner. Jeff Friesen Calgary Flames 1-time Stanley Cup champion with the New Jersey Devils. Ric Jackman Anaheim Ducks 1-time Stanley Cup champion with the Ducks. Darius Kasparaitis New York Rangers 1st Lithuanian NHL player; Olympic gold, silver and bronze medalist. John LeClair Pittsburgh Penguins 1-time Stanley Cup winner with the Montreal Canadiens, Olympic silver emdalist; 5-time NHL All-Star. Eric Lindros Dallas Stars Olympic gold and silver medalist, 5-time NHL All-Star, Hart Memorial Trophy wiiner, Lester B. Pearson Award winner. Scott Mellanby Atlanta Thrashers Over 1400 games played. Petr Nedved Edmonton Oilers Olympic silver medalist. Joe Nieuwendyk Florida Panthers 3-time Stanley Cup champion with the Calgary Flames, Dallas Stars and New Jersey Devils, Olympic gold medalist, 4-time NHL All-Star, Conn Smythe Trophy winner, King Clancy Memorial Trophy winner, over 1200 games played. Mike Ricci Phoenix Coyotes 1-time Stanley Cup winner with the Colorado Avalanche; over 1000 games played. Pierre Turgeon Colorado Avalanche 5-time NHL All-Star, Lady Byng Memorial Trophy winner; over 1200 games played. Oleg Tverdovsky Los Angeles Kings 2-time Stanley Cup champion with the New Jersey Devils and Carolina Hurricanes, Olympic bronze medalist, 1-time NHL All-Star. Alexei Yashin New York Islanders Olympic silver and bronze medalist. ^ "Mighty Ducks of Anaheim to Change Name to Anaheim Ducks in 2006–2007" (Press release). Archived from the original on March 11, 2007. Retrieved June 15, 2007. ^ Cazaneuve, Brian (October 25, 2006). "NHL's best by numbers". Sports Illustrated. Archived from the original on November 5, 2006. Retrieved November 9, 2017. ^ "2006–2007 Standings by Conference". National Hockey League. Retrieved March 26, 2012. ^ "2006-07 NHL Regular Season Standings". Yahoo! Sports. Retrieved November 28, 2007. ^ "2006–07 NHL Regular Season Standings". Retrieved November 28, 2007. ^ "2007 NHL Awards: Finalists and winners". ESPN. June 14, 2007. Archived from the original on February 22, 2011. Retrieved November 29, 2007. ^ a b c d "Crosby, Lecavalier pick up NHL awards". CBC Sports. June 7, 2007. Archived from the original on February 22, 2011. Retrieved November 29, 2007. ^ "Bill Masterton Memorial Trophy". Archived from the original on January 17, 2010. Retrieved November 29, 2007. ^ "Conn Smythe Trophy". Archived from the original on January 17, 2010. Retrieved November 29, 2007. ^ "Lester Patrick Trophy". Archived from the original on January 17, 2010. Retrieved November 29, 2007. ^ "Ovechkin Named to NHL First All-Star Team for Second Year". Washington Capitals. June 14, 2007. Archived from the original on February 22, 2011. Retrieved December 5, 2007. ^ "NHL jersey ceremonies". Archived from the original on February 22, 2011. Retrieved November 29, 2007. ^ Molinari, Dave (September 13, 2006). "Mario doesn't want No. 66 re-retirement ceremony". Pittsburgh Post-Gazette. Archived from the original on February 22, 2011. Retrieved November 29, 2007. ^ "Shanahan reaches 600 goals". CBC News. Associated Press. October 5, 2006. Archived from the original on February 22, 2011. Retrieved November 29, 2007. ^ Brooks, Larry (November 20, 2006). "Jagr Joins 600 Club". New York Post. Archived from the original on December 4, 2008. Retrieved November 29, 2007. ^ Podell, Ira (November 21, 2006). "Jagr passes Kurri as Rangers win 4–0". The Boston Globe. Associated Press. Archived from the original on March 4, 2009. Retrieved November 29, 2007. ^ Ginsburg, David (February 10, 2007). "Jagr Reaches 1,500 Points As Rangers Win". The Washington Post. Associated Press. Archived from the original on February 22, 2011. Retrieved November 29, 2007. ^ "Avs' Sakic collects 600th in victory". USA Today. Associated Press. February 16, 2007. Archived from the original on February 22, 2011. Retrieved November 29, 2007. ^ "Caps ruin Sakic's historic 1,500-point mark". Associated Press. October 26, 2006. Archived from the original on February 22, 2011. Retrieved November 29, 2007. ^ Allen, Kevin (November 16, 2006). "Numminen sets NHL record for longevity among European players". USA Today. Archived from the original on February 22, 2011. Retrieved November 29, 2007. ^ "Avs spoil Selanne's 500th with shootout win". USA Today. Associated Press. November 23, 2006. Archived from the original on February 22, 2011. Retrieved November 29, 2007. ^ "Bondra's 500th goal hands Chicago a win". Associated Press. December 23, 2006. Archived from the original on March 4, 2009. Retrieved November 29, 2007. ^ "Penguins' Recchi named NHL's top star". CBC Sports. January 29, 2007. Archived from the original on February 22, 2011. Retrieved November 29, 2007. ^ "Mighty Mike: Modano nets 500th goal". Associated Press. March 15, 2007. Archived from the original on February 22, 2011. Retrieved November 29, 2007. ^ "Modano highest-scoring U.S.-born player". Associated Press. March 18, 2007. Archived from the original on March 4, 2009. Retrieved November 29, 2007. ^ "Malkin ties NHL goal mark". CBC Sports. November 1, 2006. Archived from the original on February 22, 2011. Retrieved November 29, 2007. ^ "Elias Says …". Elias Sports Bureau. February 14, 2007. Archived from the original on February 22, 2011. Retrieved November 29, 2007. ^ Goldstein, Wes (October 11, 2007). "Colorado's Stastny continues to live up to family legacy". CBS Sports. Archived from the original on February 22, 2011. Retrieved November 29, 2007. ^ Wawrow, John (March 7, 2007). "Avalanche bury Sabres; Stastny matches mark". USA Today. Associated Press. Archived from the original on February 22, 2011. Retrieved November 29, 2007. ^ "Crosby youngest to net 200 NHL points". CBC Sports. March 2, 2007. Archived from the original on February 22, 2011. Retrieved November 29, 2007. ^ "Rangers, Panthers play ... in Puerto Rico". Associated Press. September 24, 2006. Archived from the original on February 22, 2011. Retrieved December 5, 2007. ^ "Ducks undefeated in a record first 16 games". Associated Press. November 10, 2006. Archived from the original on February 22, 2011. Retrieved December 5, 2007. ^ "Oilers top Panthers for 1,000th win". Associated Press. January 3, 2007. Archived from the original on March 4, 2009. Retrieved December 5, 2007. ^ "Elias Says ..." Elias Sports Bureau. February 23, 2007. Archived from the original on February 22, 2011. Retrieved December 5, 2007. ^ Wawrow, John (February 22, 2007). "Buffalo 6, Ottawa 5, SO". Associated Press. Retrieved December 5, 2007. ^ "Simon suspended for rest of season, playoffs". CBC Sports. March 11, 2007. Archived from the original on February 22, 2011. Retrieved December 5, 2007. ^ Podell, Ira (July 23, 2007). "Isles sign still-suspended Chris Simon". The Boston Globe. Associated Press. Archived from the original on March 4, 2009. Retrieved December 5, 2007. 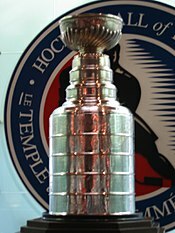 ^ "Maurice Richard Trophy". Archived from the original on January 17, 2010. Retrieved December 5, 2007. ^ Spector, Mark (April 10, 2007). "Still no MJ, but Lecavalier's clearly a star". MSNBC. Archived from the original on February 22, 2011. Retrieved December 5, 2007. ^ "Washington 2, Tampa Bay 5". Associated Press. March 31, 2007. Archived from the original on February 22, 2011. Retrieved December 5, 2007. ^ "2006–07 NHL Points Leaders". Archived from the original on February 22, 2011. Retrieved December 5, 2007. ^ "NHL roundup: Hasek blanks Columbus". Pittsburgh Post-Gazette. Associated Press. April 4, 2007. Archived from the original on February 22, 2011. Retrieved December 5, 2007. ^ "Elias Says ..." Elias Sports Bureau. April 3, 2007. Archived from the original on February 22, 2011. Retrieved June 20, 2008. ^ Gelston, Dan (April 5, 2007). "Brodeur breaks NHL mark with 48th win". The Boston Globe. Associated Press. Archived from the original on March 4, 2009. Retrieved December 5, 2007. ^ "Avs Win Season Finale". Associated Press. April 8, 2007. Archived from the original on February 22, 2011. Retrieved December 5, 2007. ^ Morris, Jim (April 12, 2007). "Wonder twin powers activate Canucks in OT". Toronto: Canadian Press. Archived from the original on February 22, 2011. Retrieved December 5, 2007. ^ Cheadle, Bruce (June 3, 2007). "Russell happy to be back". Toronto: Canadian Press. Archived from the original on February 22, 2011. Retrieved December 5, 2007. ^ "Malkin injured in NHL debut". CBC Sports. September 20, 2006. Archived from the original on February 22, 2011. Retrieved December 5, 2007. ^ "Former NHL star Tony Amonte experiences growing pains as Thayer Academy coach - MaxPreps". maxpreps.com. January 26, 2012. ^ "Belfour enjoys outdoors, coaching sons in retirement". NHL.com. ^ "Veteran NHLer Peter Bondra retires, becomes GM of national Slovak team". NHL.com. ^ "Goalie Sean Burke announces retirement - CBC Sports". cbc.ca. ^ "Career finished for Clymer" (in German). ERC Ingolstadt. June 30, 2011. Archived from the original on October 7, 2011. Retrieved June 30, 2011. ^ "MIKE DUNHAM NAMED GOALTENDING COACH". NHL.com. ^ "This Former NHL Goalie Will Hire You- But Not Because of Your Resume - The Small Business Journal". thesbjournal.com. ^ "Reconnecting with Meadow Lake's Jeff Friesen". wordpress.com. September 20, 2011. ^ "Hangin' With ... Retired NHL Defenseman & Verzasca Group Co-Founder Darius Kasparaitis". www.sportsbusinessdaily.com. ^ "Goalies shine in low scoring affair". reddeeradvocate.com. ^ "Eric Lindros retires from NHL - CBC Sports". cbc.ca. ^ "Thrashers' Scott Mellanby retires - CBC Sports". cbc.ca. ^ "Nedved announces retirement from hockey". NHL.com. ^ "No regrets as Joe Nieuwendyk retires from NHL - CBC Sports". cbc.ca. ^ "Mike Ricci retires from NHL - CBC Sports". cbc.ca. ^ "Pierre Turgeon retires from NHL - CBC Sports". cbc.ca. ^ Leitereg, Neal J. "Former Mighty Duck Oleg Tverdovsky prices Bel-Air villa at $8.5 million". latimes.com. ^ "Going one-on-one with Russian general manager Alexei Yashin at the 2013 IIHF Ice Hockey Women's World Championship". www.hockeycanada.ca.